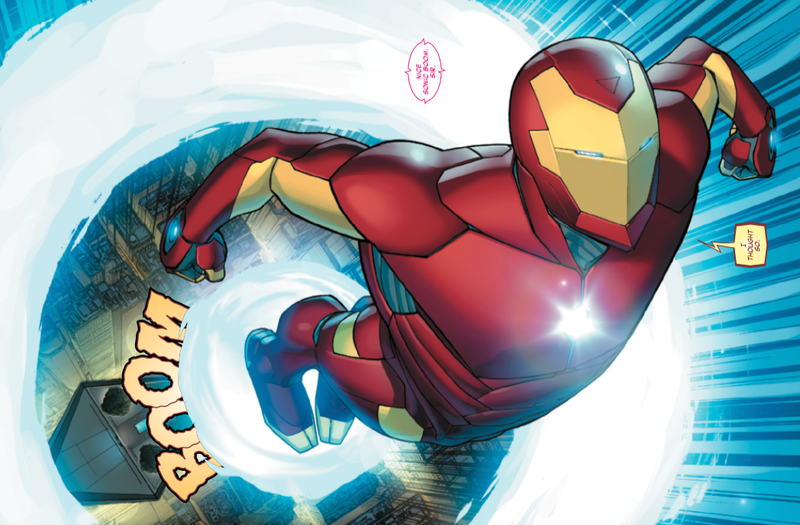 Not a whole lot is changing with Tony Stark in the new Iron Man comic debuting tomorrow. He’s still an egotistical genius billionaire who flies around saving the world in high-tech power armor. Whew. But one of the people he tussles with on a semi-regular basis looks a whole lot different. Invincible Iron Man #1 is one of the first comics in Marvel’s All-New, All-Different initiative, which has them relaunching their entire publishing line in the aftermath of this year’s big—and, because of delays, still unfinished—Secret Wars event. While a lot of other titles will feature new takes on various heroic legacies, this debut issue seems designed to reassure longtime fans that the Stark they know and love is still intact. The creative team—Brian Michael Bendis, David Marquez, Justin Ponsor, and Clayton Cowles—give readers scenes of Tony doing what he does best: putting the finishing touches on a new, modular set of armor, wooing a famous, beautiful scientist and verbally sparring with an AI assistant. But, no surprise, things are brewing that undoubtedly will set Tony’s life spinning in new directions. Invincible Iron Man #1 opens with a scientist who worked for evil research organization Advanced Idea Mechanics handing over a briefcase to Madame Masque. including the fictional country of Latveria, which isn’t ruled by Victor Von Doom anymore. Just because he’s not in charge doesn’t mean he’s totally absent. The last time we saw Doom’s face in Secret Wars #3, it wasn’t pretty. We don’t know what happens to Dr. Doom in the remaining issues of Secret Wars. That series won’t wrap up until December. We do know, though that there is a Dr. Doom in this all-new, all-different Marvel. And the aftermath of his time with godlike power has changed him, to the point where he openly admits to needing Tony’s help when the billionaire inventor touches down inside Castle Doom. The set-up here teases that a tenuous rivals-with-common-enemy partnership in the classic style between Doom and Stark. But some of the plot points hint that Tony’s upcoming adventures will go beyond his typical corporate espionage concerns, with possible ripple effects to the rest of Marvel’s superhero population. So, even if he winds up becoming a just millionaire instead of a billionaire as teased in this summer’s Avengers preview comic, This first issue makes it clear that Iron Man’s still an important lynchpin in the newly reconfigured Marvel landscape.